Today was a very special day for me. I went back to Crown Pointe Care Center, my very first facility with Foundations Health Solutions in 2002. Crown Pointe is a wonderful nursing home in Columbus, with strong leadership and wonderful hearts. I had the privilege of working with a gentleman I hired in 2002 in Housekeeping and Laundry, by the name Joseph Obuobisa. 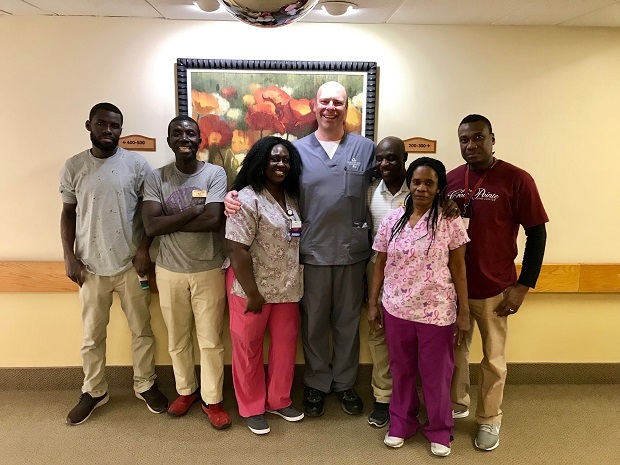 Joseph’s leadership, integrity, high standards and love for his staff and residents was quickly seen by all, and Joseph soon became the Director of Housekeeping and Laundry. 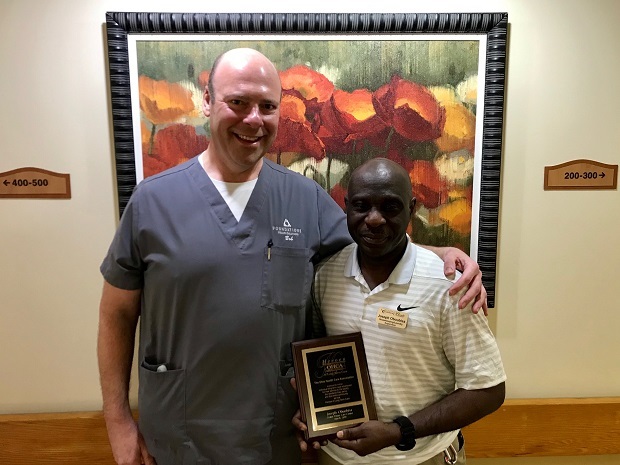 Joseph’s commitment to quality has recently been recognized by the Ohio Health Care Association, Ohio’s largest long-term care association as March’s Hero of Long Term Care. Joseph represents everything that is good about our industry. I am proud to call him a friend. Joseph was born in 1964 in Ghana. His father was a Medical Doctor in the Military. Joseph also entered the Ghana Military in 1985 after getting his father’s blessing. Joseph quickly moved up in the ranks and became a weapons instructor at the Military Headquarters. In 1998, Joseph began having trouble seeing out of one eye and eventually in 2000, decided to retire from the military and move to America to seek treatment. Joseph had a friend from Ghana that was living in Columbus, Ohio and so he came to Columbus to seek treatment and a job. In 2002, he came to Crown Pointe and I interviewed him. I had no idea I was in the presence of a former Sergeant and Weapons Instructor in the Ghana Military. All I knew was this young man was impressive and I wanted him on my team. Joseph, I am proud to know you. Your physical sight may not be what it once was, but your ability to see the good in others has never been better. Your leadership is an inspiration. Your love and commitment to your staff and your residents is second to none. Thank you for being a part of our Culture of Care. You set the bar high. I pray I never let you down, my friend. p.s. – Thank you to the Housekeeping and Laundry Team at Crown Pointe. I loved spending time with you. You’re all an inspiration! !